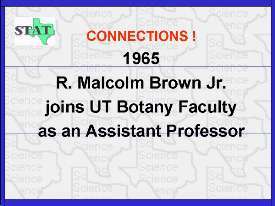 RMB completed his doctorate at The University of Texas at Austin in 1964 then was invited to do a post-doctoral in Dr. Bold's lab. That year, Dr. Bold became ill, and RMB helped to keep the Bold lab running until Dr. Bold could return. He also collaborated with Kenneth Smith, a famous insect virologist from Cambridge who had come to use the then world-famous electron microscopy facilities at the Cell Research Institute (founded by W. Gordon Whaley).